You’ve been asking and we’ve listened. Today we’re updating our iOS and Android apps to address the most popular feature request we’ve received over the past 2 years: Gas Prices! We’ve partnered with OPIS to bring real-time fuel prices to iExit. This means updated-daily prices for unleaded, mid-grade, premium, and diesel are now available for the vast majority of gas stations found in iExit. In the past when you searched for, say, Diesel Fuel, you would see upcoming gas stations, by exit, that sell diesel fuel, but you wouldn’t be able to see any diesel price information. But as of today, that station’s current price for diesel will appear right next to its name. On the right shows an example of a diesel search when traveling on I-85 Northbound out of Atlanta. This works the same for searching for unleaded, mid-grade, and premium. 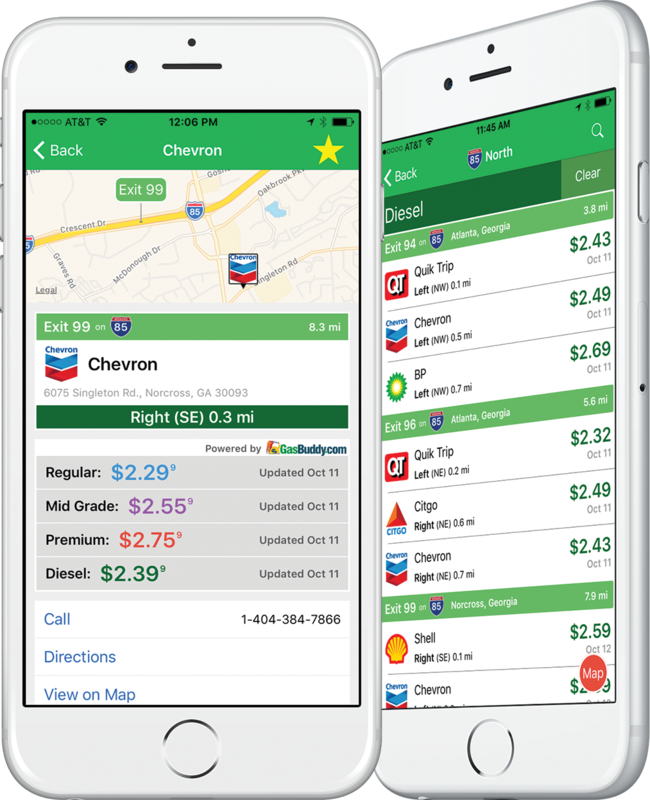 iExit for iOS costs $0.99, but includes lifetime access to gas prices in the cost. iExit for Android is free to download, but access to fuel prices costs $1.99 for lifetime access. For any questions regarding our OPIS integration, drop us a line at feedback@iexitapp.com.